The Midland WR120EZ Radio is among the most affordable alternatives that can now be bought on the market. Even if it is remarkably inexpensive, the model manages to do what it is supposed to do. 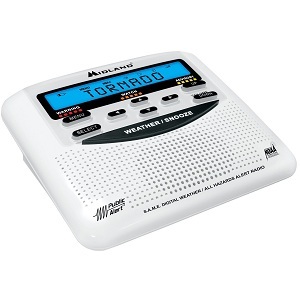 Furthermore, it comes with all the features one might ever be looking for in an emergency weather radio and is able to detect any types of warnings about floods, tornados, and thunderstorms. Since it features SAME alert programming, this unit is undoubtedly worth considering. Usually, a low price triggers poor quality. This is not the case with the Midland WR120EZ Radio. However, there’s a disadvantage that is worth mentioning. The radio is not capable of being powered other than by using 3 AA batteries. This lack automatically eliminates power source reliability and versatility, as the user is required to carry backup batteries everywhere he or she goes. 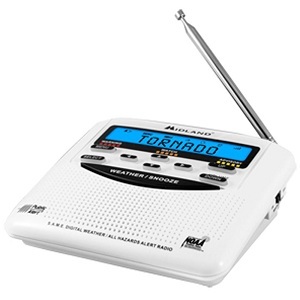 If you have no trouble with keeping the radio or the batteries in your car, in your house, or in your carrying bag, you may benefit from using the Midland WR120EZ Radio. On the other hand, if you risk forgetting the batteries in the event of a disaster, you might be better off with a hand crank unit. The Midland WR120EZ Radio has all the specs one might ever desire. For instance, the model has SAME localized reception and seven preset weather channels, as well as color-coded alert indicators. The unit has been tested and proved to receive over 60 types of alerts and recognize and broadcast all hazards alerts. Furthermore, this device can be utilized with great results both in the United States and Canada. Aside from capturing and rendering NOAA data, it is able to detect all Environment Canada channels. The seven weather channels of NOAA have an efficiency of 93% on the surface of the United States, which means that most of the individuals living in the U.S. are well-covered. Any product, regardless of its price, brand or quality of build, has to be easy to use and work with. Luckily, this is the case with the Midland WR120EZ Radio, as users have a lot of freedom when it comes to selecting the functions they want to choose. Customizing the device is easy and can be performed promptly. The entire warning system can be adjusted to one’s heart’s content. Consequently, buyers can choose various kinds of voice, display, or tone alert types. Programming is silent with the Midland WR120EZ Radio and can be performed depending on the county where the buyer lives in. Unlike other models we have consulted, this one can be bought for an affordable price. A variety of online marketplaces sells it for close to fifty dollars. By contrast, Amazon offers it for a much fairer price. Therefore, Amazon customers can take advantage of the retailer’s sale discounts and get it for meager prices such as thirty dollars. Considering that the device can be utilized in English, French, and Spanish, it speaks to the needs of users of different ethnicities. Additionally, if you ever decide to sell it and get a more expensive model, you will be able to do so as the buyer will have the freedom to select the language he or she is most comfortable with using.